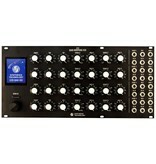 The E370 Quad Morphing VCO is a DSP-based, quad oscillator Eurorack module from Synthesis Technology. 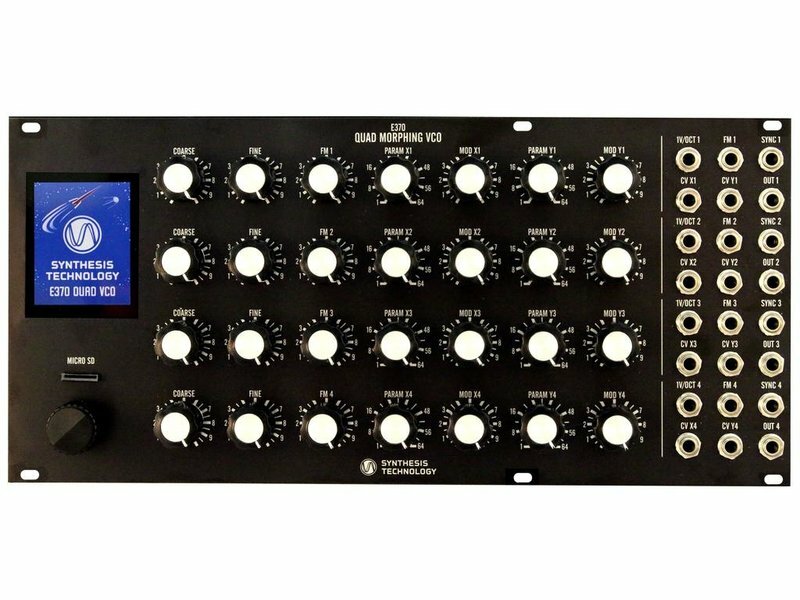 Using improved algorithms from the E350 Morphing Terrarium, the E340 Cloud Generator and the new E330 Multi-Mode VCO, the E370 is the most technically advanced Euro oscillator available. The four VCOs can be individually controlled, used in a set of two pairs, or ganged in “Unison”. A full-color TFT display is used in a ‘shallow depth’ menu system and can show each VCO’s output in real-time (oscilloscope mode). A micro-SD card slot allows users to load in their own custom wavetables and to save & load presets into the E370. The display is a 2.4in (diag.) color TFT (non-touch, 240 x 320 pixels) with a rotary encoder/pushbutton and micro-SD card. The large size of the display allows for “shallow menu diving”, so that every major function (reading wavetables, setting up the mixer, etc) has a minimal subset of pages (the majority is a single sub-page). Data is entered/selected using the rotary encoder which has a “mouse click” shaft. The display is refreshed using high-speed SPI over a DMA channel for minimal ‘lag’. The mSD card can optionally load and store presets in the E370. The factory presets contain all 192 wavetables from the E350. When a preset is loaded into or saved from the E370, all the wavetables for the 4 VCOs are also stored. Each VCO can have its own set of 64 wavetables.